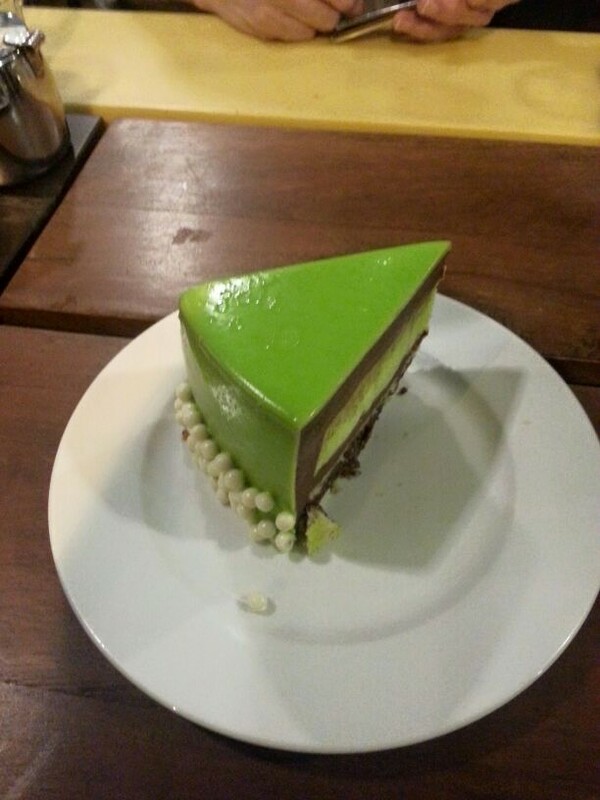 a RI friend is a proprietor of kith cafe at park mall & sentosa cove (kith has another outlet at robertson quay). kith does all day breakfast (till 5pm) and seems like a good coffee place too. a cafe for friends – good name! a few friends went early & took a short walk at fort canning park. the rest of us got a tour of our friend’s high end office chairs & system furniture shop adjacent to kith cafe. 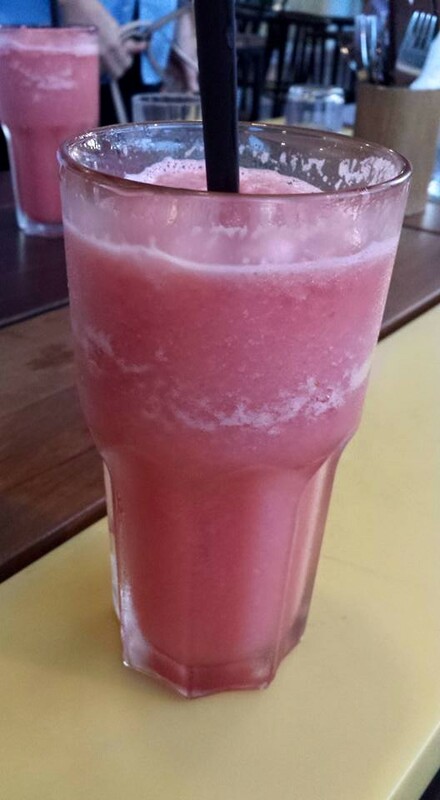 the friend ordered watermelon & lychee smoothie for a few of us. it was good, refreshing, quenching, not too sweet. not particularly a favourite for me though. some ordered ABC – apple, beetroot & carrots me think…sounds healthy. i will try that one next time. 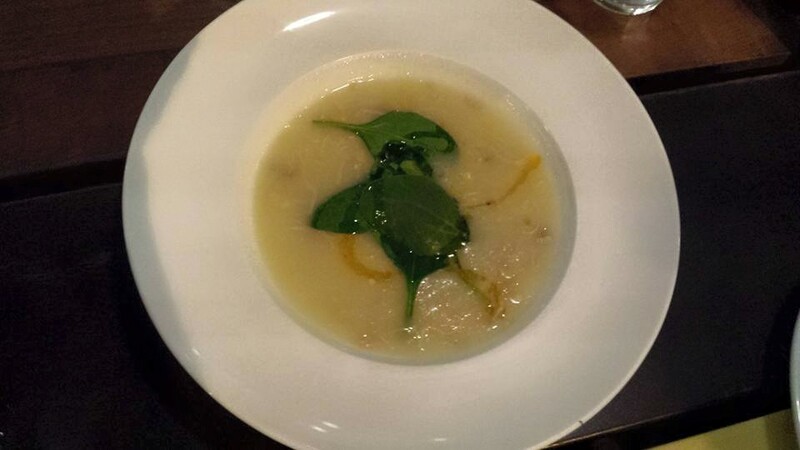 couple friends ordered a soup. think it was the soup of the day, maybe a sweet corn soup. 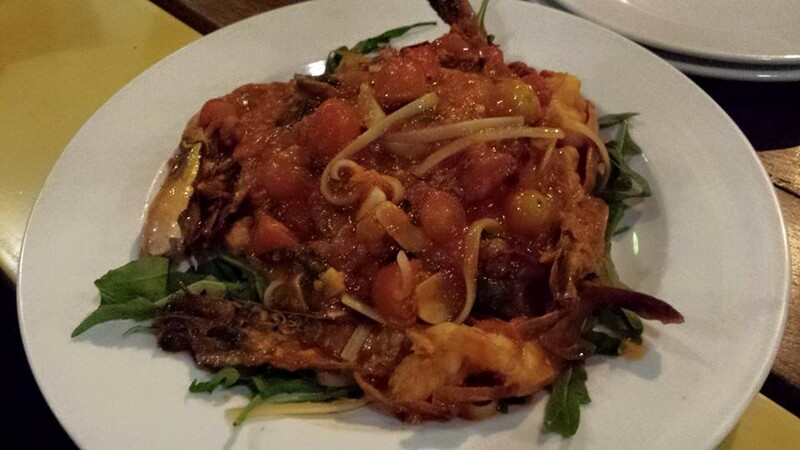 looked ok.
my friend ordered some calamari & 2 pizza to share, and each ordered our own pasta dish. 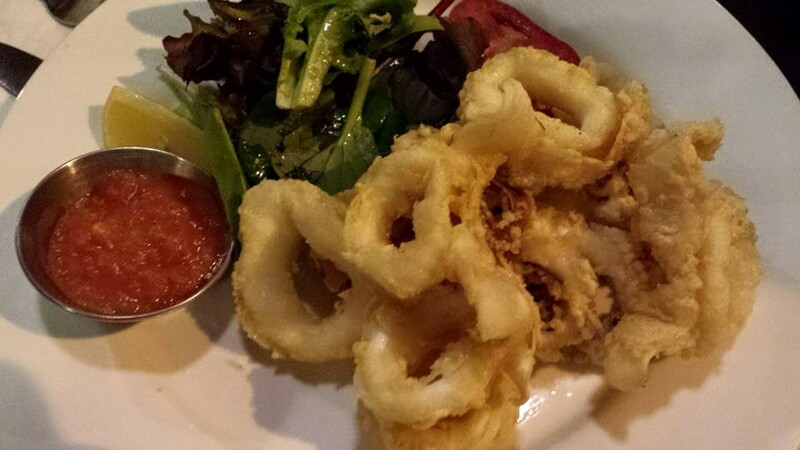 calamari was good. 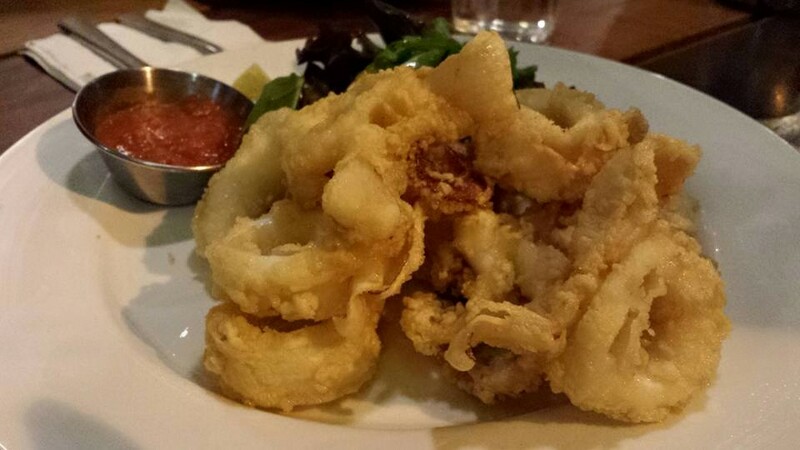 squid was very slightly tough, batter was good. the gong bao chicken pizza was better than i expected. 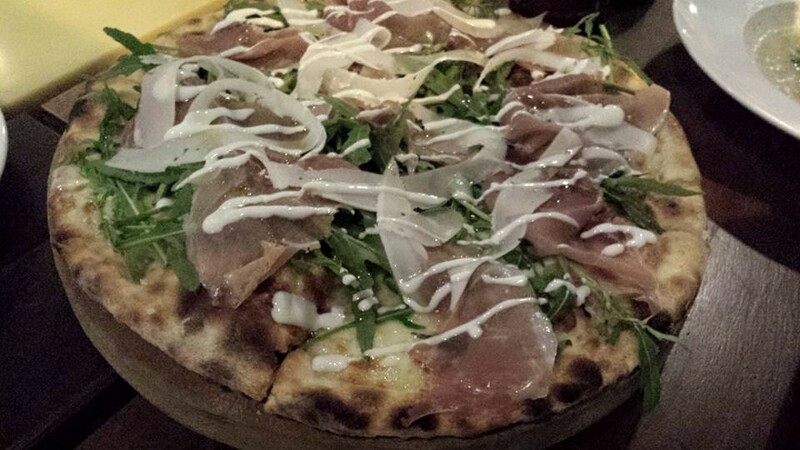 we all liked the thin crust pizza. 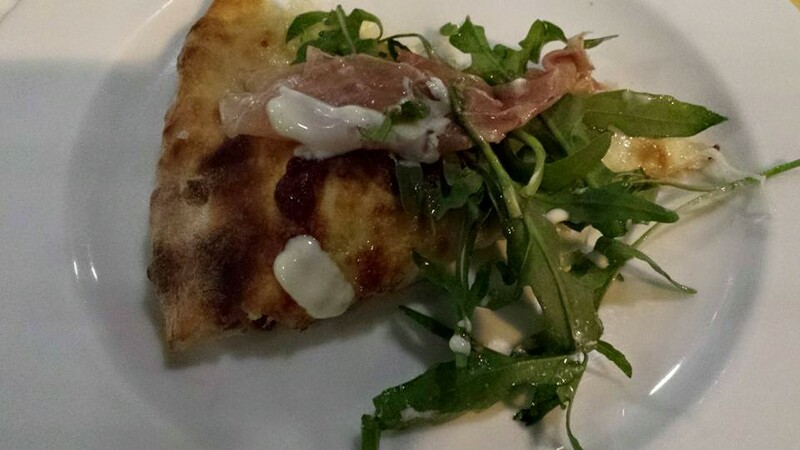 pizza not particularly my favourite but it is an excellent dish for communal dining & i do enjoy a slice of good pizza (i shared 1/2 gong bao chicken & 1/2 parma ham pizza with a friend) to start the dinner. 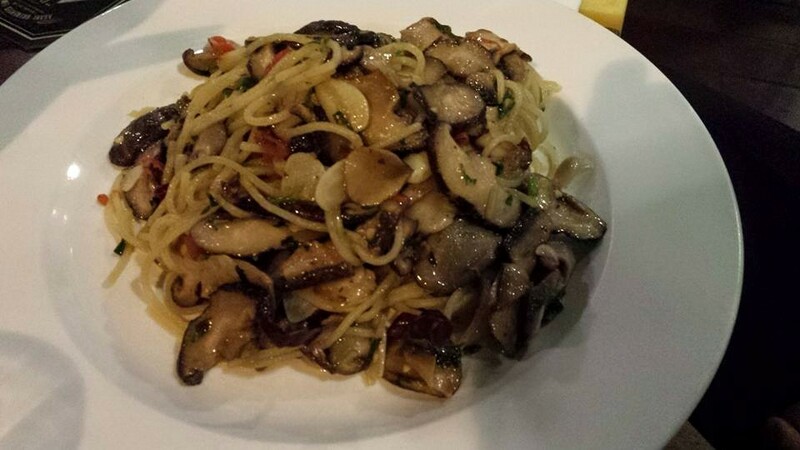 the spaghetti alio olio was good! 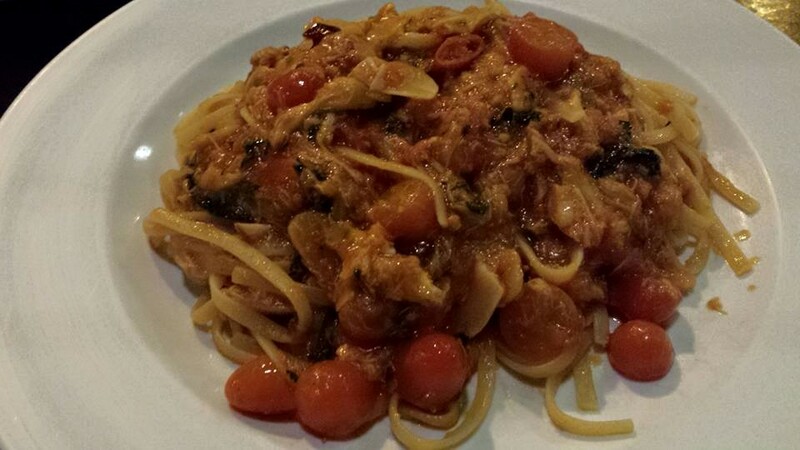 the linguine gamberini (garlic prawn) looked good. i will order that next time. carbonara. looked ok. somehow looked a bit like hokkien mee. egg was mixed in the pasta. i think it would taste good as most pasta here were good. 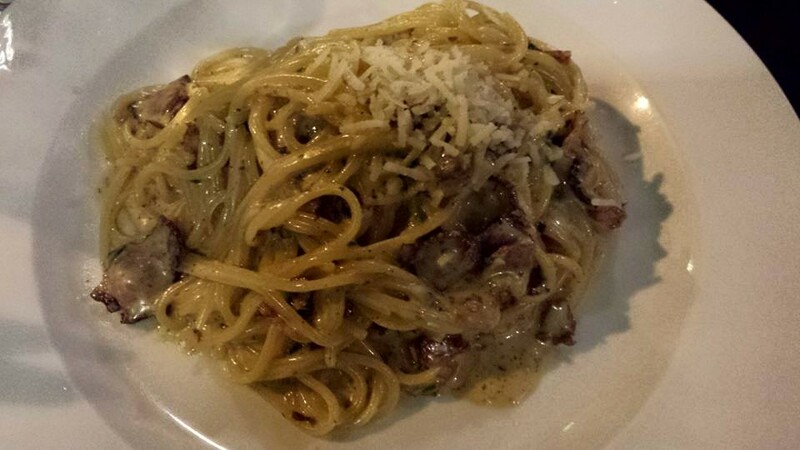 though i am more used to the look/colour of carbonara at alfresco gusto. 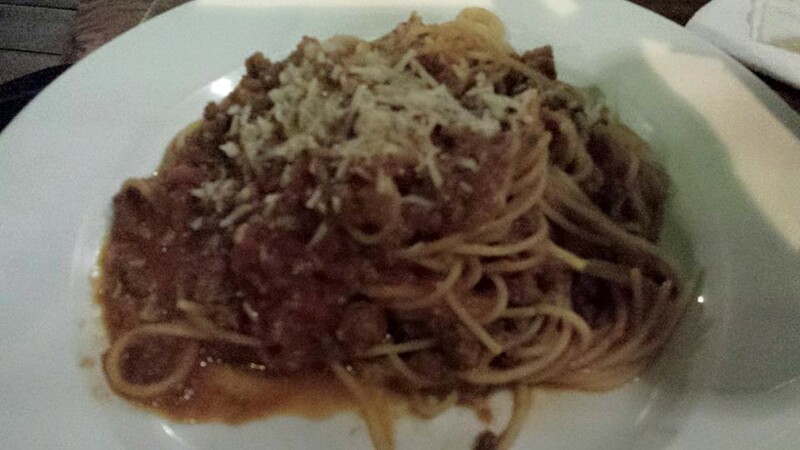 i had a try of the bolognese, and the tomato sauce was good. meat sauce/ragout preparation not my favourite but this was good. they said vongole is a test of a pasta chef. 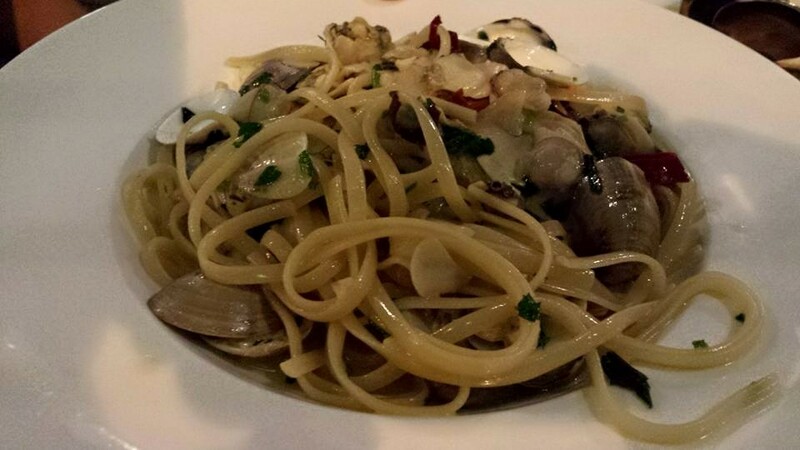 the lala (littleneck clams) have a distinctive shellfish taste & if the linguine is done al dente the combination is quite excellent. 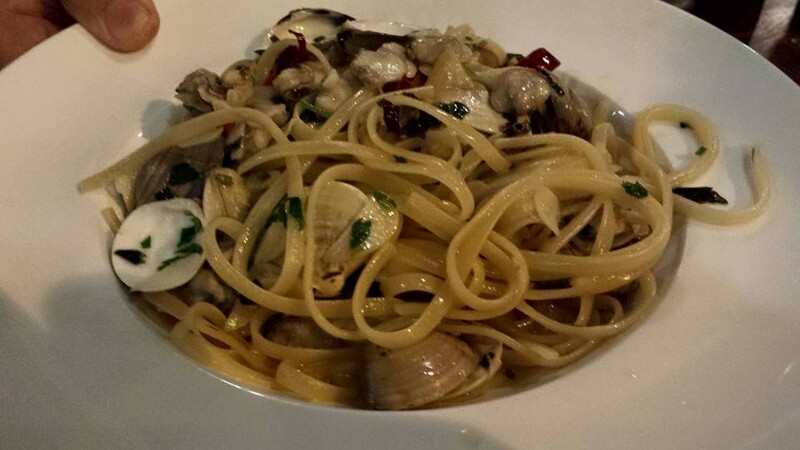 my own vongole linguine here. 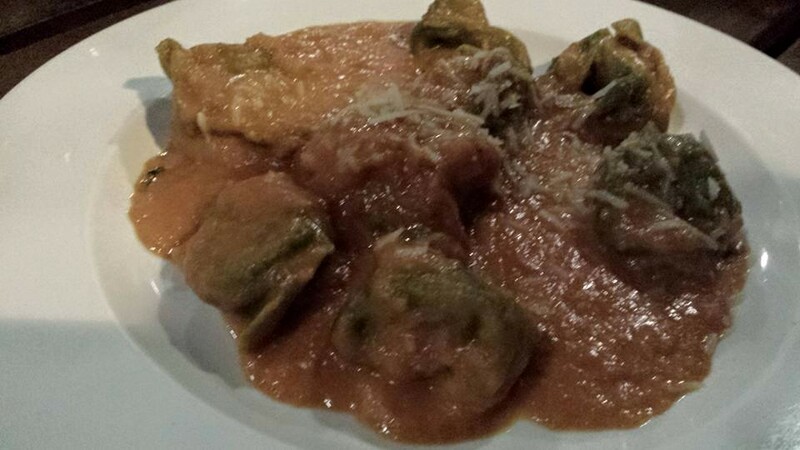 the veal spinach tortellini looked interesting. 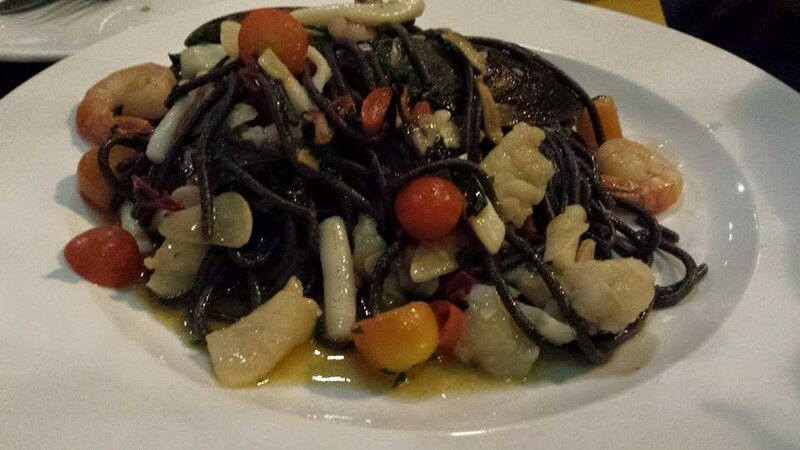 my friend the proprietor ordered the day’s special, a squid ink spaghetti with seafood alio olio. i tasted. it was good. 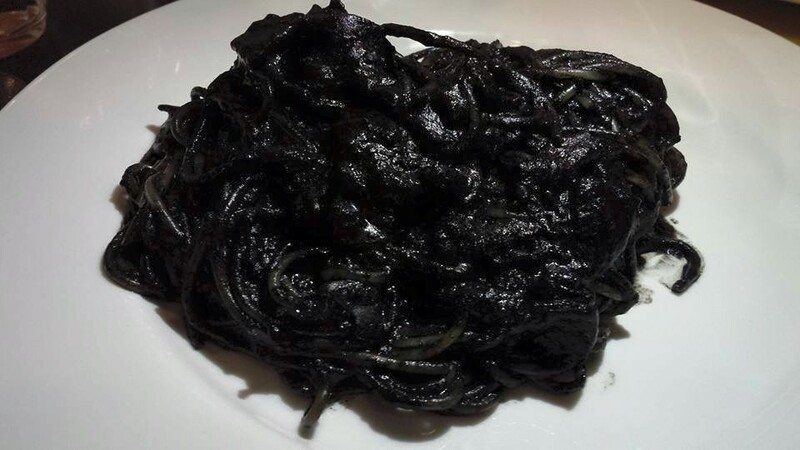 i liked my own squid ink sauce pasta better though. 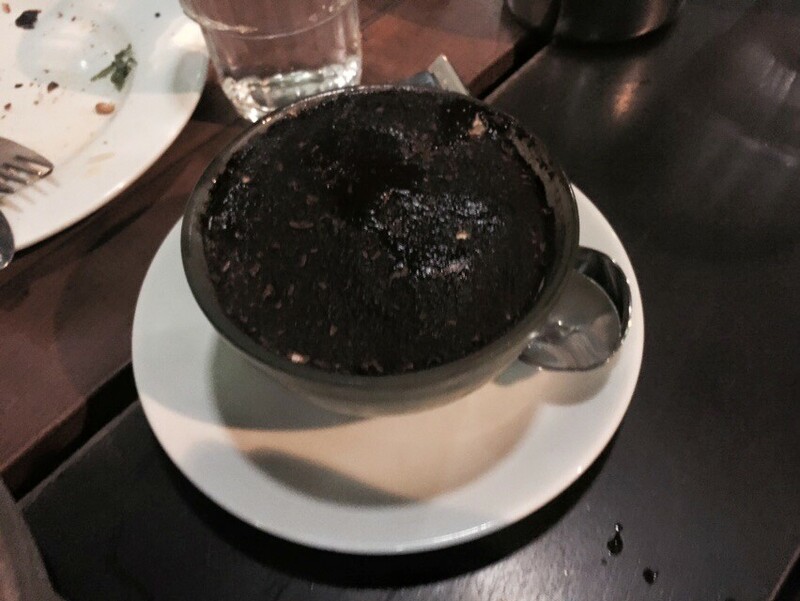 it was more intense & flavourful, though my immediate reaction was it was a bit salty. my own squid ink seafood spaghetti here. the friend who shared 1/2 my squid ink thought it was very salty, and that the alio olio was also salty. 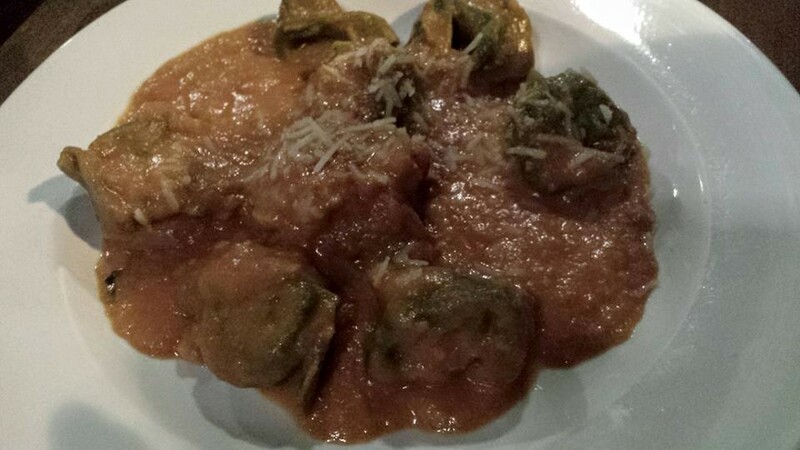 i was good with the alio olio, & salt does bring out the flavours (though too much would kill it). 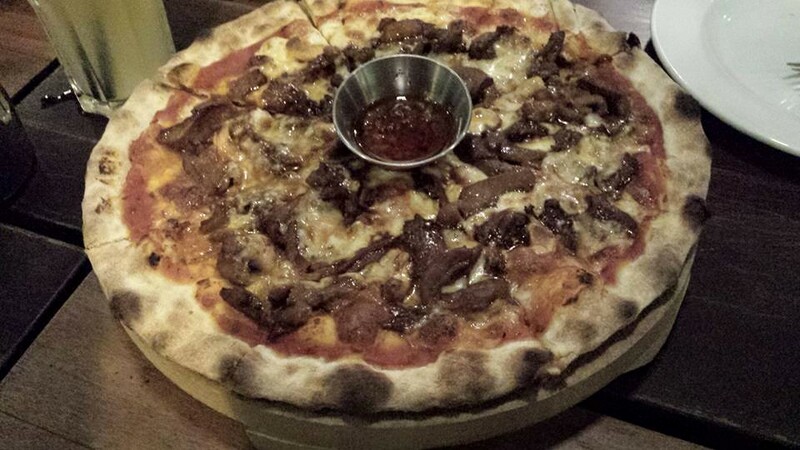 my friend the proprietor ordered 2 more pizza – a duck & mushroom ragout & a special – with sausage. my phone died so i did not have photos. duck ragout was good & had some meat pieces. 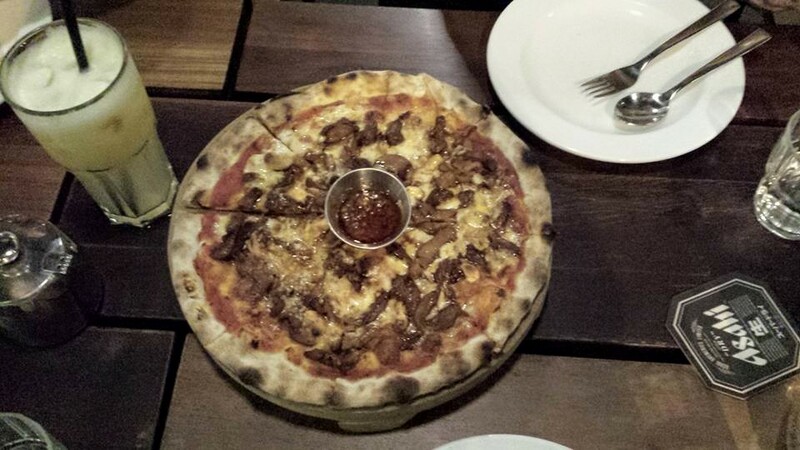 i liked the sausage special pizza a bit more, sausage very flavourful. the pastry chef among us went to select the dessert. 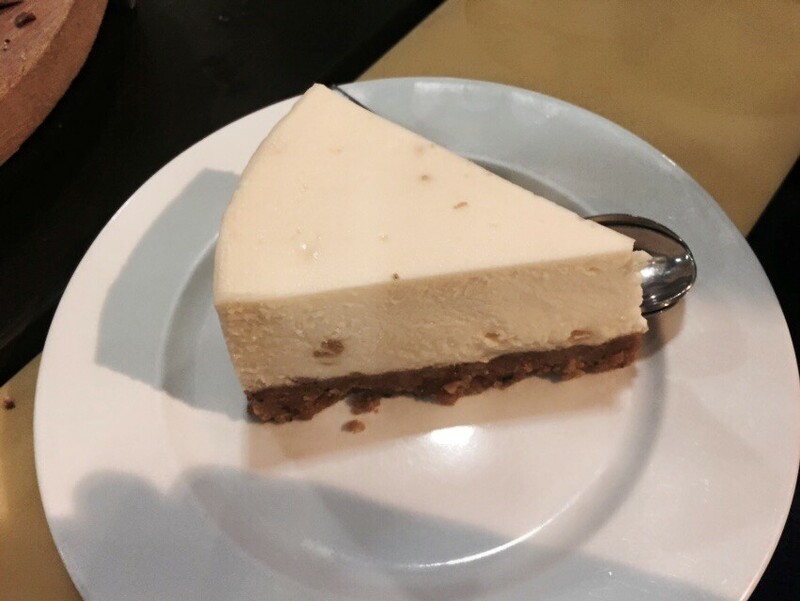 i didn’t think much of the yuzu cheese cake nor the biscuit base. probably i was programmed to think anything yuzu must be specially good. this was average so-so to me. didn’t think much of the tiramisu either. i had a small teaspoon scoop near the top, somehow thought it felt like penna cotta. that did not prepare me for interrogation by our pastry chef. she asked if i tasted the lady finger biscuits. 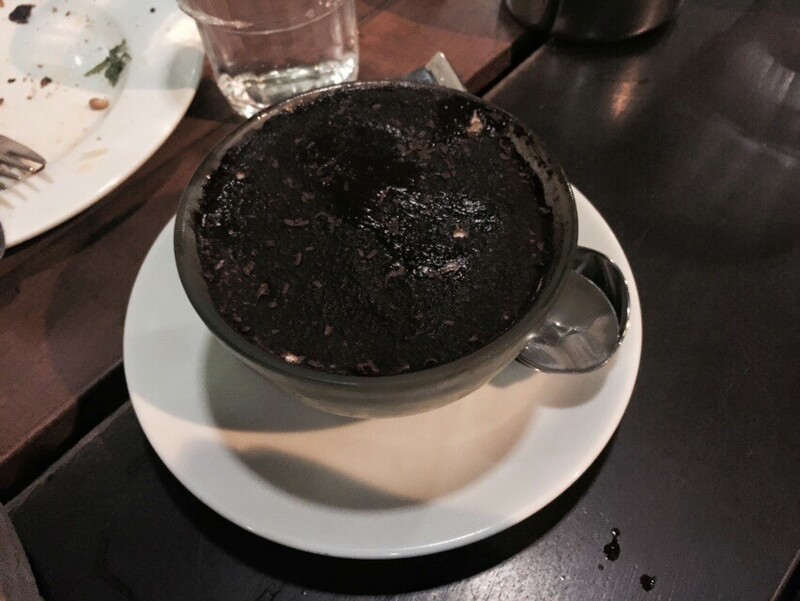 seemed that i didn’t (i guess that’s why i thought it tasted like penna cotta – soft, light w/o the tiramisu texture) nor did i tasted coffee or liquor. 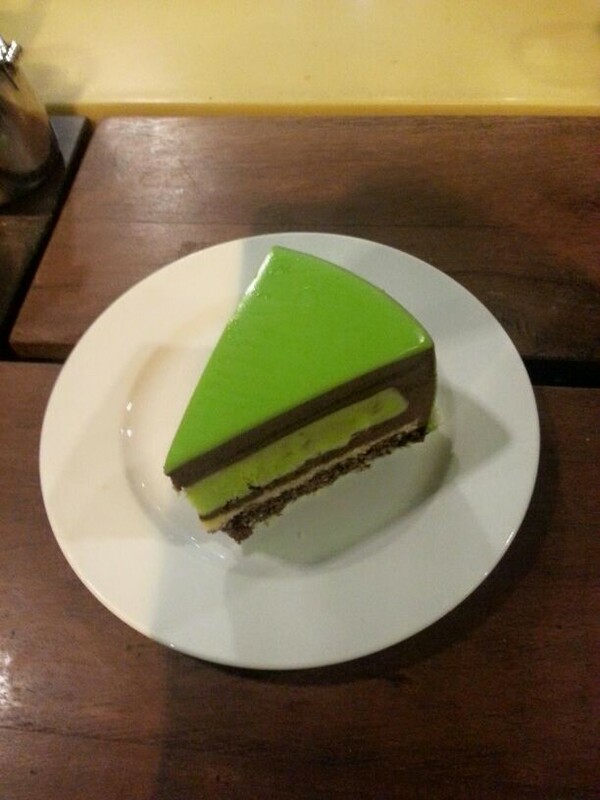 the lemongrass chocolate cake looked really pretty, but it’s not my thing. my least preferred of the 3 dessert. i had a flat white afterwards. it was good. but didn’t feel that it was in the chye seng huat, dutch colony, or the assembly coffee category.